Susan Peña and Miguel Govea have performed together for the past twenty years throughout the San Francisco public schools and libraries, often accompanied by their two daughters, Rene and Cecilia. The songs on “Susan Peña’s Favorites” were selected for having proven consistently fun and educational with children of all ages and language backgrounds, due in part to their interactive elements (clapping, call and response, tongue-twister, dance, hand gestures, etc.). The twelve selections consist of seven songs in Spanish, two in English, and three in both Spanish and English. Most are Mexican or American folk traditionals, and some are original versions of old classics. Musical styles include cumbia, huapango, son jarocho, vals, and Appalachian folk. The instrumentalists are Susan Peña on guitar and vihuela, Miguel Govea on accordion, trumpet, violin, vihuela, and guitarrón, and guests Bill Foss on mandolin and Jorge Liceaga on requinto jarocho. The vocals range from the particularly enchanting sister duets by Rene and Cecilia to choral-style three part harmonies performed by all four family members. The overall tone of the recording is upbeat and fun, inviting listener participation. The CD is available for $14.00 at www.cdbaby.com. For more information about this and other recordings by La Familia Peña-Govea, visit www.miguelgovea.com or contact Susan Peña at susanmpena@sbcglobal.net. My 3rd grade class at Guadalupe Elem. loves this CD. I hear them singing it as they go down the hall.The rhythms and sing along patterns make it easy and fun for all to join in.Buy this CD- you'll love it! good songs, but the quality of the recording can be better. "I cried when I heard the green grass grows..."
"We received the cd on Friday and Luna pretty much knows all the songs by heart now! I cried when I heard the Green Grass Grows...it's great to hear all your beautiful harmonies and love the trumpets!!" Our family has become quite attached to this CD. My daughter, almost 3 years old, loves the music and wants to know what all the Spanish words mean, and has an increased interest in learning Spanish (as well as playing music). It is also much better for adults than other kids CDs. We saw the Pena-Goveas play live (and went back a few times) and that is also part of the attachment. The music is high quality but fun and accessible. My five year-old cousin, Maya, and I have been playing this wonderful cd nonstop ever since it arrived in the mail two months ago. Maya, who is beginning to learn Spanish in her kindergarten class, already knows the words to "Elena la Ballena" and the bilingual lyrics to "She'll Be Comin' Round the Mountain." We love to sing along! 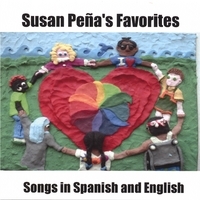 With its fun lyrics and diversity of musical styles, "Susan Pena's Favorites" is a fantastic resource for families and educators who want to provide Spanish language and cultural enrichment for their children. I'm looking forward to sharing these songs with my preschool class.